R.J. Haney Heritage Village and Museum is open from May 15 to September 21, 2019, Wednesday through Sunday. During July and August the facility is open 7 days a week, 10am to 5pm. The Archives room is open all year. Days of operation are Tuesdays, Wednesdays, and Thursdays from 10am to 4pm. Heritage Week – February 18-23 – "Heritage: The Tie that Binds": At R.J. Haney Heritage Village & Museum we know how to celebrate our Shuswap history and in February we take our show on the road. In partnership with The Mall at Piccadilly, the Museum is celebrating “Heritage: The Tie that Binds”, this year’s Heritage Week theme. Activities include pioneer displays, silent auction table, pioneer breakfast, Best of the Shuswap Pie Baking Contest and Auction, kid’s craft station, gold panning and much more. There is something for everyone at the 23rd Annual Heritage Week celebration. For more information on this community event contact the Village & Museum at 250-832-5243. Pancake Breakfast - May 18 & 19, 9:00am-11:00am - Come and celebrate the opening of the season and enjoy our famous $6.00 Pioneer Pancake Breakfast Saturday & Sunday from 9am-11am. High Tea at R.J. Haney Heritage - May 26, 1pm to 3pm - This timeless tradition of afternoon tea is an occasion to celebrate politeness, good manners, and community. R.J. Haney Heritage Village & Museum invites you to the 10th Annual High Tea . Enjoy an afternoon of tea, treats, entertainment and stories. Tickets for High Tea can be purchased by phone, call 250-832-5243. Seating is limited, don’t be disappointed and purchase your tickets early for this popular spring event. Father's Day - June 16, 8:30am to 2pm - Bring the whole family and celebrate Father’s Day. Treat Dad to a Pioneer Pancake Breakfast and stay the whole day. Enjoy musical entertainment wagon rides, old fashioned carnival games of chance and skill, face painting, children’s crafts, panning for gold, a BBQ lunch, displays and more. Come play the pioneer way, a great day to enjoy with Dad! Admission at the gate. Dinner Theatre – July 3 to August 28 - Celebrating twenty six years of Villains and Vittles Dinner Theatre Productions, opening night is July 4th, with shows every Wednesday, Friday and Sunday evening in July and August with a special matinee performance on Thursday, August 15th. Written and directed by Peter Blacklock, Peter is known for his original musical scores and humorous story telling while sharing the history of the Salmon Arm area. Enjoy a home cooked dinner with all the pioneer fixings, served at 6:00pm from Marjorie’s Tea Room. Dessert follows the play with homemade rhubarb crisp and ice cream. Pioneer Day, July 14, 8:30am- 2pm - You are invited to join R.J. Haney Heritage Village & Museum on Sunday July 14th for our annual Pioneer Day celebration. The day will be full of activities and events themed around Salmon Arm’s history and its settlers. Visitors are encouraged to come dressed in costumes from the era and enter the costume contest for prizes! You can participate in the old fashioned races and games like toss eggs and tug-a-war, old fashioned midway games, photo booth, wagon rides, visit the petting zoo and so much more. Admission at the gate. Soiree and an Evening at R.J. Haney Heritage Village - TBA - Join us for the 10th Annual Soiree. You don’t want to miss this charming evening of music, food and fun! Ticket holders are treated to a five course feast, prepared by our guest Chef and paired with local wine and craft beer. Seating is limited and tickets can be purchased by calling 250-832-5243. You will receive a tax receipt for half the cost. This is a fund raising event supporting extraordinary projects, restorations and operations at the Village. Classic/Antique Car Show - August 11, 8:30am to 2pm - The 20th Annual Classic Antique Car Show the largest in the Shuswap features over a hundred classic and antique automobiles displayed throughout the Village. This Car Show has become a favorite for car collectors, fans and spectators from far and wide. Help pick the “People's Choice” as you chat it up with the car owners. Enjoy the great entertainment and excellent food. Fun for the whole family. Admission at the gate. 22nd Annual Harvest Celebration - Sept. 8, 3pm - 6pm - Come and enjoy the taste of the Shuswap and treat yourself to a mixture of mouth watering local cuisines from some of the best restaurants, delis, cafes, wineries and breweries that our region has to offer. Tickets are $27.00 and can be purchased by calling 250-832-5243, or by visiting R.J. Haney Heritage Village at 751-Hwy 97B. You won’t want to miss this special afternoon of food, drink and entertainment. 14th Annual Cemetery Tour - Sunday, Oct. 13, space is limited to 35 special guests – reservations are required!! A guided tour of the old section of the Mt. Ida Cemetery features Curator/Archivist Deborah Chapman's personal favourite list of characters. Stories of love, heartbreak, joy, and tragedy are told on one of the prettiest knolls in Salmon Arm. Cost is $10.00 per person. Spooktacular: October 19 & 20 - Experience things going bump in the night! It is that time of the year to pull on your scariest costume and explore the spooky side of R.J. Haney Heritage Village for the 24th annual Spooktacular. Do you think you are fearless enough to venture through the Spook Trail, Haunted House and Shady Lane. There are menacing creatures around every dark corner. For the little spooks, enjoy the not so scary Story Book Trail, the Coloring Room, stories and more. Gates open at 5:00pm. Come dressed in your favourite Halloween costume! Ghouls and Ghosts under 13 must be accompanied by a responsible adult. Admission at the gate. 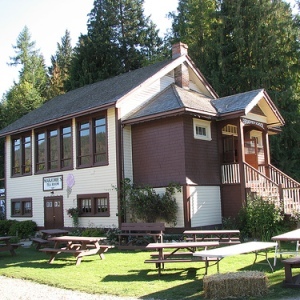 May 15 - R.J. Haney Heritage Village & Museum and Marjorie’s Tea Room opens for the season. Hours of operation: Wednesday – Sunday 10am-5pm. July and August the Village and Museum are open Monday – Sunday.